"Easy to make and bake stuffed whole flounder. This tastes great and looks beautiful." Preheat the oven to 300 degrees F (150 degrees C). Lay the fish down dark side up. Make an incision next to the backbone on both sides, stopping before the head and tail. Slip the knife in between the flesh and backbone and run the knife down the ribs on both sides of the backbone. Melt the remaining butter, and brush some of it onto a cookie sheet. Stuff the stuffing mixture into the pockets of the flounder, and place the stuffed fish on the cookie sheet. Brush the outside of the fish with melted butter, and season with the Old Bay and if desired, Cajun seasoning. Very good, a little salty. Seems fancy but is actually very easy. 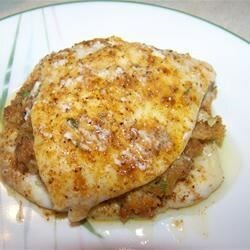 If using frozen flounder filets, place one on the bottom, spread stuffing on top and cover with a second filet.